I focused on the hairstyle of Padme and Rey and both have an evolution. Rey has kept her hair in the same three buns since the day her parents sold her off to Unkar Plutt because she's afraid they will forget who she is. but we can also see it in another way . while for Padme, when they are on the planet Naboo, even the style of her cloths changes. Many people talking about how Rey and Kylo are shown to be children in TFA, and adolescents in TLJ. In TFA Rey has a lot of youthful exuberance; Kylo has his angry outbursts, hides behind a mask, . In TLJ, Rey wears close-fitting clothing that shows her shape, and of course we see Kylo's full display, signaling a sexual awakening in both characters. Meanwhile, they both rebel against parental figures in their lives. Localisation : it's in the chorus of Pavement's "Unfair"
I apologise if this is incredibly off track, but here's a recent interview of Natalie Portman discussing visiting the SW set. There's not much said really, but it's nice to know that she's accepting her place in the whole mythology now and acknowledging it more often (eg. SNL). It's a good sign that PT characters especially Anidala are sort of back in people's discussions and not in a cringey sort of way. I'm sort of hoping that Hayden would also come to terms with it and talk about it more openly like Natalie just has. Also, Padmé and Poe as friends, who would've thunk it! @Teo oswald wrote: I focused on the hairstyle of Padme and Rey and both have an evolution. I like everything you write! This is so amazing. When we'll have good quality, we can compare a reaction from every side. The most important part it's WHEN Anakin stops hurting Padme. What a great thread this is! It’s a treat to read through everyone’s thoughts on Reverse Anidala as I’ve recently been thinking about Anakin and Padme vs Kylo/Ben and Rey. I see this thread started back before TLJ was released.. now it’s out, we can explore this in a more concrete way, but commenters here were totally on the ball before TLJ! While I avoid all the talk of dvd special features at the moment, I might go back to the PT and spend some time pondering Anakin and Padme! I’m hoping because I love Reylo so much that my appreciation for Anidala will grow in light of the overall story of the nine movies. What about the love story? Thanks for sharing this article snufkin – really interesting ideas! I’m going to watch the PT and read this again!! -this link seems broken, I’ve tried to track this down but no luck. If anyone manages to find this can you please share with us the new link? Thanks! I think this trilogy would be about Kylo's feelings for Rey going from possesive and selfish to selfless and self-sacrafising which was the opposite that happened with Anakin.I also think it's important that despite how messed up Kylo mgiht be right now he feels compassion for Rey(which is important since it was Luke's compasison that led to Vader redeeming himself) while at least to me Anakin went from idolizing Padme(while Kylo is in awe of her I don't think he idolizes her,he was able to see her memories after all which is something much more deeper and intimate and something Anakin was unable to do with Padme) to feeling an unhealthy attachment to her.I remember reading in the novel ''The Rise of Lord Vader'' that Palpatine was aware of how unhealthy Anakin's feelings for Padme were and that's why he send him and Obi Wan to guard her in ATC.That's the oppsoite of what Snoke sences in Kylo when it comes to Rey and why he probably intended to kill her in front of him or have him do that. @CienaRee I see it this way too CienaRee! @SheLitAFire wrote: After Matt Martin's answers to tweets this thread is like "hey guys, remember me?" Ben/Anakin: "we can rule the galaxy together"
Rey/Padme: "Don't go this way. Please." I know someone already pointed it out above, but the juxtaposition of snow fight on Starkiller Base in TFA and Padme and Anakin's final scene on Mustafar in ROTS. Black Diamond=happy ending!!! The Skywalker curse is broken! "Love is the balance"
Reverse Anidala is still one of my favorite things to contemplate. The contrast between Starkiller snow and Mustafar lava is awesome! @MyOnlyHope wrote: … One of the most central tensions between Anakin and Padme was actually political, and I think a similar tension needs to be resolved in the ST. Where Anakina and Padme failed, Rey and Kylo will succeed. @MyOnlyHope - Love your insights about the relationship and competing political views and values! This was definitely at the heart of Anakin and Padme’s differences.. and at the end of TLJ it is what is keeping Kylo/Ben and Rey apart! There is definitely some major events taking place here in bringing IX to a satisfying conclusion! I find Kylo/Ben’s views at the end of TLJ a little vague – without specifics.. but there is at least clearly a difference between Rey and Kylo/Ben in how they view the past and how they think they should deal with it for the future.. Through reading the vader comics of late- I’ve been really struck by how Vader sooo did not want to be Palpatine’s 2IC. He was constantly at war with Palpatine, working behind his back and working at taking control in loads of ways. I think Anakin was fine with dictatorship so long as he was the one doing the dictating… and he kept on working at taking on that role bristling under Palpatine’s cruel controls along the way.. Vader did not want to be dictated to! [but thought everyone else should be fine with it lol] I think this is where Vader’s ambition, and arrogance – amplified by the dark side- really did a job on Anakin’s humanity.. I think with Kylo/Ben he also hated being under the Snoke yoke – but his relationship with Rey helped him to overcome this while IMHO not losing his humanity. @Lamiller1390 wrote: Something I noticed about Padme and Anakin was that their love, at least on Anakin's Side was more...obsessive. He was totally obsessed with Padme and that kind of dynamic is just begging for danger. Anakin loved her but Lust is a more... accurate term of how he felt for her and how he interacted with her. They were never on equal footing either. Padme having a lot of Political sway while Anakin, very powerful with the force had almost no sway within the Jedi itself. Likewise, Padme had no force abilities that we are aware of. They were never equal and in balance with each other…. ...I would like to see a relationship blossom inversely from Padme and Anakin. One born of mutual respect and equality in the sense that they are both Equally powerful in the Force. That their love is not an obsessive one but a compassionate one and one of understanding. That they find a compromise in their perspective opinions and views of the world and that is how they bring balance. Hi Lamiller1390- I enjoyed your thoughts! I’ve quoted the part of your comment that really resonated with me. I agree that the quality or nature of the love between Anakin and Padme contrasts with what we have seen of Rey and Kylo/Ben at this point – and where we all seem to think it is headed in IX! 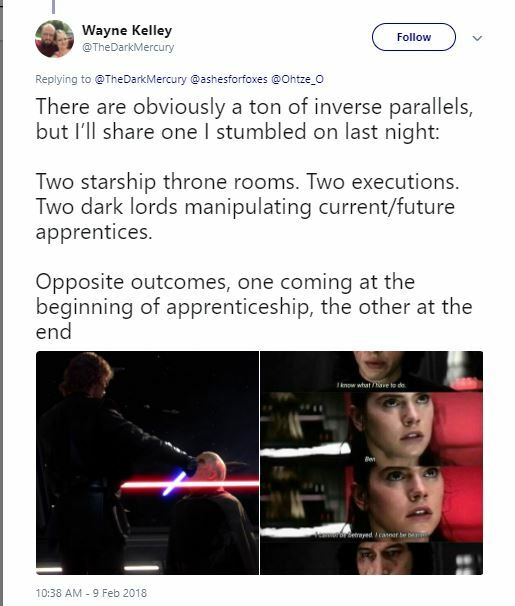 How the A/P relationship fits in with the prophecy of Anakin being the chosen one is a really interesting thing.. I’m not sure yet what to make of that! I need to ponder that some more I think! But it may be important as the balance of the force seems to be central to Reylo, the will of the force and their connection. I tend to resist the conclusion that Padme not being FS was part of the problem – I don’t think it was a decider or compulsory for their relationship to to work.. there were other issues at play.. [But it is definitely a strength that Reylo share FS!] There was a genuine connection there between the two of them – but it was a different quality. I need to watch the PT and put together some thoughts on it, but TLJ encourages me to view Anidala in a less black and white way than I have on previous viewings. The relationship was not all bad, unhealthy or dysfunctional… but there was definitely an issue with Anakin and attachment – before you even bring the whole Jedis are not supposed to have attachments thing into it. It was a terrible combination of elements that came together I think – and turned something which could have been wonderful into something that became eventually tragic, tainted, unfulfilled…. -yeah! Now some have the dvd we’ll really start to get the good stuff!!! Thanks for sharing this vid. Very interesting!!! But also so interesting that two such similar scenes take place at very different points in their love stories. We can rule together: for Anidala happens in their final act. For Reylo it happens in their 2nd - Tell us much about where Reylo is headed I think! It’s fun to explore where we can see the inversion of the relationships.. whether or not it is meant to be understood at anything more than a thematic level. There is certainly hints in the dialogue and visual storytelling to refer us back to Anidala and to encourage us to compare the two love stories – as part of experiencing this story itself I think. Snoke = exploits/manipulates familial love, underestimates romantic love…. A few other reversals that really resonate with me..that have been discussed already.. In Ep 1-3 Anakin’s love for Padme becomes more selfish and possessive. In Ep 7-8 Kylo/Ben’s love for Rey grows.. I see his feelings for her growing into at times selfish and possessive love in TLJ..with elements of self-sacrifice. However, I would not say his actions in the throne room were purely that. It’s more complicated at this point in the story -IMHO of course! If it’s reversed in IX, Kylo/Ben’s love for Rey is going to become truly selfless and non-possessive. In ep 1-3 Anakin moves from being a Jedi, to hunting down Jedi/killing Jedi- as they've been outlawed/declared traitors. One final contrast in direction relates to violence! Yep violence! This is star wars after all..
Anakin and Padme start off peaceful.. and end in violence - with Anakin basically escalating into committing a violent act against Padme which cost her life..
Kylo/Ben and Rey start off at war.. hunting/being hunted - shooting, kidnapping, being interrogated, fighting etc.. lets see what happens in IX. lol. but in TLJ we saw them join together and Kylo/Ben refuse to take her life.. and while on Crait Kylo/Ben attacks - it is less direct and in the wider context it is less impactful than what we saw in TFA (IMHO of course). Me thinks in IX Kylo/Ben and Rey will finish the arc peaceful with each other! I think it’s fun to explore how Anidala is similar to Reylo as well as how it is different.. thinking about all this is pretty new to me! -A class difference between the two. -One born a slave/ one born free. Other thoughts I don’t think have been mentioned..
-quite an age difference between the couples! -one a political leader (Senator/ SL), the other represented the Jedi (at various points in their respective stories). -both relationships develop basically in secret, in isolation from others. I was really struck by this recently – how no one else in the universe knew of their relationships for large chunks of their respective love stories (Okay, maybe Snoke sort of knew.. but he doesn’t count. Lol. And yes, eventually Luke found out but he’s now relegated to FG!). Okay.. it's been fun gotta run - bye all! Hi All, a quick question for anyone in the know..
Was it 'reverse Anakin' that was described? or 'reverse Anidala'? I believe that was Jason Fry, who said he got to write an "inverse hero's journey" for Kylo in the novelization. Something like that. @adamdrivershair wrote: I believe that was Jason Fry, who said he got to write an "inverse hero's journey" for Kylo in the novelization. Something like that. Ohhh really?! that's interesting! thanks for helping me out adamdrivershair! I was watching some of the Wayward Jedi videos about reborn Anakin and Padme (and agree almost 100% with what he says), but I was just wondering if they are in fact reborn Anidala, how much is the last film going to spell that fact out for us? And if it's not spelled out explicitly, what sort of "hints" do you think we can expect to see that will allow people to connect the dots? I mean, a story is always better when they don't spoonfeed the nuances to the reader/audience, but I keep going back and forth on this and how much I'd want them to spell out. There have already been some clues aside from the many visual and narrative parallels, clues like, "There's too much Vader in him" and Snoke referring to him as "Heir apparent to Lord Vader." But will there be anything else? This isn't really overt, but one thing that might be interesting to note is the use of Force ghosts in IX. If we see Luke, and we also see Obi-wan and like... Qui-Gon, lol... but we DON'T see Anakin, I'm going to take that as a tip-off that we don't see Anakin because Ben is Anakin. @nickandnora wrote: I was watching some of the Wayward Jedi videos about reborn Anakin and Padme (and agree almost 100% with what he says), but I was just wondering if they are in fact reborn Anidala, how much is the last film going to spell that fact out for us? And if it's not spelled out explicitly, what sort of "hints" do you think we can expect to see that will allow people to connect the dots? I mean, a story is always better when they don't spoonfeed the nuances to the reader/audience, but this I keep going back and forth on. There have already been some clues aside from the many visual and narrative parallels like, "There's too much Vader in him" and Snoke referring to him as "Heir apparent to Lord Vader." But will there be anything else. I keep wondering about Maz seeing “the same eyes in different people.” It was brought up again in the TLJ novel. Oh yes, that's another clue that the reincarnation theory might be literal (but again, within the confines of the films themselves, they might just let the audience piece that together). Now, speaking of Maz - I saw referenced somewhere that the last time Maz saw Han was 20 years before the events of TFA, and I kind of gaped when I read that because it fits into a theory of mine that I have about her (that also connects to reverse Anidala, kind of). Does anyone know where this specific timeframe was mentioned, or was it mentioned in the movie and am I just forgetting? The thing Wayward Jedi said about the manner of Padme's death (which I had honestly never thought about because I wasn't interested in thinking about the prequels in general), in which her lifeforce is basically absorbed into Vader/Anakin's to keep him alive is insanely fitting for what I think might be happening in the sequels in terms of reverse Anidala. So if Padme basically followed Anakin into the Underworld, they were "one" in this manner, with her being that tiny bit of light left in him/Vader. At the end of Return of the Jedi that little bit of light finally had grown to the point where he was able to save Luke, and die perfectly balanced. Balanced Anakin/Padme are then reincarnated (together, because they were "one" from the point that Padme died onwards, remember) as Ben Solo. Ben Solo is perfectly balanced for the first 10 years of his life, when something happens with Snoke that tips the balance. Whatever bit of light that is excised from Ben that day was used by the Force to create Rey, ie. the reborn Padme. Anakin and Padme are two separate beings once more, and can go about setting things right for real this time. It works because it's the total inverse of Padme's death/Vader's birth. Yes, I am not sure which of his videos it is in, but Wayward Jedi stated the exact same. The reason we haven't yet (and he predicts we won't in Ep.IX) seen Anakin's FG in the ST is because Ben is Anakin reborn. I've said many times on this forum that I really love Wayward Jedi's vids...and agree with 95% of what he says. I am just not sure how on board I am yet with the whole reborn thing. Don't get me wrong, it is an interesting concept and I am not against it at all. If that's where they are going to take the story...I am good with it. I am just not sure I've seen enough evidence yet to convince me that it is truly where they are going. He makes a lot of compelling arguments for it and would never have given it a thought if it wasn't for his vids. I truly appreciate his analysis...they always make me stop and think. Bottom line for me, if it ends up being a reverse or reborn Anidala, it won't matter to me as long it's a compelling story where we get to see Kylo's redemption (with Ben Solo alive) and an epic Reylo ending!! Ah, that's silly of me. I only watched the two videos; I should have known he would have addressed that very point (about lack of Anakin's force ghost) himself. I'm kind of similar to you in that I'm alternately SUPER onboard with it, but sometimes a little wary as well. From a storytelling perspective, I think it's very nearly perfect and completely satisfying. From a character perspective though (and as someone who loves Kylo and Rey as individuals), I think perhaps I'd be a little sad in thinking that they're literal constructs of a previous generation. However, there are definitely some ways they could get around this problem. Since there are those in the film keen on labelling Kylo/Ben as "Darth Vader reborn" as it is, maybe we're going to see a version of that where the Force ghosts of the past tell him he's Anakin (or allude to it, or something), and he'd basically say: "But I'm not him. I'm Ben Solo." Forging his own path/destiny, and coming to terms with his *true* identity. I think there’s more to Maz than meets the eye. Maz is like a narrator and an instructor to unfold the mystic of sequels to the audience, even though Maz looks harmless and insignificant at first, she could even be the physical form of the force, a supreme being or a deity who has watching Skywalker saga from afar since TPM, this trope happens in Japanese manga many times. I'm curious... Maybe how I understand 'reborn' is different to you how understand it nickandnora? I'm thinking this is the same person coming back again. is that right? I'm interested to see what wayward Jedi comes up with! For what it's worth.. here's my thinking.. If they go with reborn Anakin - and reunite him with Padme, that would mean Rey is reborn Padme no? My first instinct here is: please no. Rey's worth and identify have been overshadowed by who are her parents, what's her lineage, by Luke, by Kylo... I prefer this character to be her own person, even if Padme was super fabulous. I think going with the reborn idea complicates the character's identities. Is it possible for someone to be someone else reborn and still hold on to their own identity? I'm thinking not. But then maybe I'm mistaken.. I think we already have a sense of Kylo/Ben needing to have his own identify and not have himself defined by his grandfather/ being given his own choices in the path he takes - without the rebirth concept. Also, I'm thinking he already also has the whole Ben Solo vs Kylo Ren identify issue currently still mid arc (IMHO of course) - adding reborn Anakin to the mix could be making things complicated? I think having a generation suffer the consequences of generations that came before, and forging their own path to create a future for themselves is where the ST is at- there's a message that this life you've been given is yours to make of it what you will.. there are no life do overs with rebirth in SW universe. I think. To have poetry and healing of the past - Rebirth is not required, an embracing of heritage and acceptance of the past is enough - which I figure is where IX is headed with all Kylo/Ben's talk of killing the past and his grappling with how to do this (hint Kylo, it doesn't work- you might want to try something more 'balanced') haaaa. But! Yeah! that Maz line is super curious and interesting. I enjoy her character (more so in TFA than TLJ). I hope we see some kind of pay off for it somewhere in the SW verse! Where has Maz seen Finn's eyes before??!!! I thought it was referring to the repeating of history over a millenia - as she had been discussing the empire and now the first order - that over long time frames history repeats and thus so do the eyes of people and what they are experiencing. but heck, maybe it is more literal than that! I think we haven't seen Anakin yet because they are saving it for IX, when all nine movies come together.. IMHO. Okay gotta run! Well, I hate the "reborn" Anakin/Padmé theory to be honest and I don't think that's what they're going for anyway. Anakin & Padme are dead and one with the force- let them rest in peace. And I don't think that's how the force works. "Reverse Anidala" isn't the same as being literally reborn with the same souls...that's a plot I really hate in all kind of stories so I truly hope Star Wars won't do it. Imagine- Leia hating her biological father that caused her so much pain and now his soul is in her son who again causing her so much misery? That's just so wrong, sorry! "Ancient eyes". It was as if Ben had been waiting around for a millennium to show up at just this moment in history. Maz: "I have lived long enough to see the same eyes in different people." What do you think about this? Where do that "ancient eyes" come from? Just like Lucas said, "it's like poetry, it's rhythm", somehow Ben Solo will be linked to an old character of this saga, mostly Anakin at this point, or someone that we just don't realize him yet. I also remember that it happened in SW Rebels too. In the ep that called A World Between Worlds, the voice of a few selected characters was blended with each other, and when they put those dialogues together, it suggested something special beyond it. It's kind of the biggest spoiler that we've got from LFL so far. ancient eyes can mean many things... it doesn't need to be always that someone is the reincarnation of someone else. And Anakin isn't dead as long enough to call him "ancient" - just my personal opinion. Maz said "...see the same eyes in different people" to Finn... I took it as she saw people like Finn in the past who were running away from their problems instead of fighting to solve it. I understand that Ben is Anakin in reverse metaphorically - yes, totally. But literally the Anakin as in reborn with his soul?? Meeehh! I think it actually makes sense from storytelling perspective because there were no other ways for Leia understand Anakin and how one can become monster. Yes, it's unfair to the character, but life\fate is very unfair to all Skywalkers (including Padme and Han). In SW context Luke, Leia and Han failed to learn from mistakes of older generation and history repeated itself in some ways. That's why in ST Han is sacrificing himself and Luke seeks redemption. If Leia can understand and forgive her son, she is able to understand and forgive Anakin. Leia was afraid of Ben because of Anakin and this is one the reasons Kylo was so sure that being a moster is his destiny - children exaggerate emotional messages from parents x100 times. It's now Kylo's and partly Rey's job to not repeat mistakes of all previous generations and make things right. I disagree- but it's perfectly fine... everyone is free to perceive the story in different ways. I doubt LF will spell out YES- Ben Solo is the reincarnation of Anakin Skywalker...they will leave that ambiguous for the audience to see whatever they want in the ST. I doubt too that they will spell out if it's true. But if yes, we will get hints in other sources that it was the intent. Reylo and reincarnation are so Lucas' ideas. If it was a part of his treatments it is not surprising that they are not using reincarnation idea lol. GA don't like such stuff as GA didn't like TPM. @Night Huntress wrote: ancient eyes can mean many things... it doesn't need to be always that someone is the reincarnation of someone else. Rey was obviously talking to Finn, not Kylo, and Kylo was talking to Vader, Anakin was talking to Padme in a different timeline. But they especially chose to take those lines out and arranged it together for some reasons we just don't know yet. And... sometimes the character isn't just talking to another character, but that character is also aiming at the audience too. Reincarnation is a quite familiar factor in Eastern's religion and literature like Xianxia 仙侠, but I don't see the same in Western, it's very likely that they will never say it out loud that Ben Solo is Anakin if it's true. Making the audience debate about it for a decade or at least keeping people invest in SW long enough for them to make another SW trilogy is the best choice. Completely agree, people in the galaxy far far away still see Vader as an unredeemed monster, they don't know that Vader saved their hero Luke Skywalker and Leia still doesn't forgive her father. Luke ran away without telling the truth of what happened to both Vader and Ben Solo. So Ben is the only chance to redeem Vader and help Leia understand her father. This is currently what I'm thinking as well, even though I think literal reincarnation might be what LF is intending. The good(?) news is that the PT definitely didn't spell out that Anakin (either himself or via Palpatine) literally sucked the lifeforce out of Padme so that Vader could live and left the audience to interpret that, for better or for worse, lol. I'm just saying that, plus the way that the ST toys with subtext suggests they're not going to have a long talky scene where they explain how Ben is Anakin and Rey is Padme in so many words. Maybe. Hopefully. I have to say though, Padme/Amidala is actually the biggest thing selling me on the reincarnation theory being literal (that and Campbell's Hero's Journey which suggests literal rebirth). One could argue that Anakin turned himself around at the end, so he's done what he was supposed to. But the character of Padme just kind of sits there in the prequel trilogy with all this potential, and yet she got weaker and weaker and met a really stupid end. But once W. Jedi pointed out that the point is probably that Padme was MEANT to save the world, and Anakin (the Force incarnate) was MEANT to be a supporting selfless figure, the whole damn story plus a literal reincarnation makes a hell of a lot more sense. Basically: you could argue that Anakin's story was over, but Padme's story was definitely NOT over. But you're not going to have one without the other, so here we are: Ben and Rey. The female "energy" is going to save the world (as she was supposed to), and the male "energy" is going to be selfless (as he should have been all along) and let her.